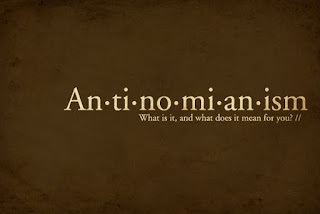 I believe the whole debate about antinomianism is confused, and has been for a long time. The trouble is that there is a fundamental problem in the way we understand the word itself. The typical way of thinking about antinomianism is that it is the opposite of legalism. Antinomianism is commonly called "license". The problem is stated thus by theologians: on the one hand you have legalism, which says you have to obey the law in order to be saved, and on the other hand you have antinomianism (or license), which says you don't have to obey the law and are free to do whatever you want. Both of these are seen as bad, and so theologians try and come up with a middle ground - a middle ground that does not exist in Scripture. Either we do have to keep the law or we don't. Such is the very nature of things and I do not see how we can escape it. As Christians, our gospel message is precisely that we do not have to keep the law in order to be saved. If that is true (and it is), then we must fall into the so-called "antinomian" camp. In that case, being accused of antinomianism is rather a great honor, since it places us with men such as Stephen, Paul, and even Jesus Himself, who were all accused of being antinomians. Of course, being accused of antinomianism is not the same as actually being an antinomian. Nothing could be further from the truth, than that these men were antinomians. This is the Biblical perspective on antinomianism. The Christians were accused of antinomianism by the religious people of their day, and Christianity must suffer the same charge against it by religious people throughout all ages. The day Christianity stops hearing the charge of antinomianism, that is the day Christianity ceases to be. It is not that Christians are in fact against the law, but that this is the perception. It is precisely because we teach that a person is justified freely by grace through faith in the redemption that is in Christ Jesus, and that this way of righteousness is "without law" (Rom. 3:21) that we are accused of it. Thus, it is the gospel that makes us antinomians in the eyes of the world, a world that doesn't understand what it is saying. They do not understand Christ. The preaching of the cross is foolisness to them. They cannot see how an ungodly sinner can be be accepted on the basis of grace, while those who are trying to obey are rejected - it seems so wrong and against the law! But the Christian sees otherwise. Paul anticipates the charge of antinomianism in Romans 3:31: "Do we then make void the law through faith? God forbid! Yea, we establish the law." How we understand this verse is of paramount importance. Paul is not saying that through faith we are led to obey the law and that therefore through that faith-driven obedience we are justified. In the following verses he goes on to say how "the one who does not work, but believes on God who justifies the ungodly, his faith is counted unto righteousness" (Rom. 4:5) and that righteousness is "without works" (Rom. 4:6). So we are not saved from the accusation of antinomianism by the above explanation. Justification is in fact without any obedience to the law, received by faith alone. Sadly, many theologians are so desperate to be freed from the charge of antinomianism that they bend and twist the gospel of grace through faith in such a way that on the other side it no longer really looks or feels like justification through faith without works anymore, though it technically is in their minds. But our gospel shouldn't be such that it can no longer be accused of antinomianism. The true gospel will always be accused of it. By the sound of many gospel presentations these days, most would never be accused of the things Paul and Stephen were accused of, because it no longer sounds like Paul and Stephen anymore. The amazing truth is this: only by believing in the gospel of justification through faith alone without works is the law actually honored and upheld. Only a Christian is not an antinomian. It is the purpose of the law to bring us to this faith, in that it shows us the unattainable standard of righteousness that is required and drives us to despair of our attaining it by our works, making us look outside of ourselves to Christ for salvation (Gal. 3:21-25). As long as a person is attempting to obey the law for justification, they are acting against the law, not listening to it, not seeing its righteous requirements, lowering the standard, and trusting in themselves. To such people, the law is really not all that glorious. The purpose and honor and righteousness of the law are not established until a person believes in Christ crucified for their salvation. Christ crucified, and justification by faith alone in Him, fulfills the law's purpose and prophecies, does honor to the law's righteous standard, and acknowledges the law for what it is: beautiful, holy and beyond our ability to attain by our works. Thus Paul could say, "I am not against the law by preaching Christ alone for salvation, I am for it!" In fact... it is the very ones who accuse the Christians of being antinomians, the legalists, that are themselves the true antinomians! They are against the very law that they are supposedly championing. This is seen so clearly in the conflict between Jesus and the Pharisees. At one time Paul was persecuting the Christian Church for this very issue. He thought they were antinomians, but he was later changed and began "preaching the faith which he once destroyed." (Gal. 1:23) He learned that what he thought was valuable in achieving righteousness before God (his works) was actually useless for this purpose (dung, to be exact), and that a man under law was only under a curse. He learned through Christ crucified that righteousness could never come by the law, for otherwise Christ would never have died, (Gal. 2:21), and he learned the sublime mystery, that only a man who is dead to the law can be alive to God. In fact, the very purpose of the law is just that - to make you die to it: "For I, through the law, am dead to the law, that I might live unto God." (Gal. 2:19). Notice that through the law you die to the law. That is, it is the law's purpose and goal to make you die to it as your means of righteousness, and therefore, whoever is not dead to the law - still seeking to be righteous before God by the law - is in fact acting against the law (the true antinomian). Simply amazing. So I reject the false notion that antinomianism is the opposite of legalism. Legalism, the belief that keeping the law is the way to be right with God, is itself the true antinomianism, and though Christians will always be accused of it because of our belief that righteousness before God is apart from the law through faith alone in Jesus Christ, we are the only ones who actually establish the law and acknowledge the law for what it is. But what about the question of those who profess faith in Christ but have seemingly no desire for holiness (such as the many professing Christians in the Bible belt)? I truly believe the answer is, that though one may have the right doctrinal formula, that is not the same as really grasping the reality of what you profess. Certainly saying you believe something doesn't mean you believe it. But my sincere guess is that most traditional Christians who grow up in the Bible belt don't really grasp what Christianity is all about. I certainly did not, even though I grew up hearing the right things my whole life. Christianity is about realizing your sin and the holiness of God and the amazing love of God revealed in the righteous grace of Christ crucified for our sins. It is something personal, moral and relational, not merely academic. A person must see through the facts to the meaningful reality behind them. This is part of the problem. But another major part of the problem is that in the Bible belt the gospel is hardly ever preached. Yes, what passes for gospel presentations are weak, adulterated, twisted, shallow, amoral, self-help, sentimental, lenient preaching of Jesus that fails to communicate the truth as it is in the New Testament. Also, much preaching in the Bible belt amounts to an erroneous attack against what they think is antinomianism. They pit legalism against license, attacking them both, leaving people with a non-existent middle ground, and thus the honor and majesty of the law is obscured and the beauty and power of the gospel is taken away. So much preaching has to do with doing, rather than believing in God and what He has done. If true good works come from a heart full of thanksgiving, and true zeal for God has its basis in the love of God in Christ, then where there is a lack of good works and zeal, there also is a lack of the truth of the gospel. We look at the problem and try to fix it, without considering the root. The root of our Christian lives must not be a desire to be right with God. It must be our rightness with God - the fact that we are right with God - which is God's amazing gift. Or to put it the way I like best: Assurance of salvation does not come from our works, but our works come from our assurance of salvation. Otherwise, what is the source of our works? It is nothing but an ugly source if it is not out of love for God because of the love of God. Thus the answer is not to move from the gospel, as if it were deficient and we needed to preach something additional, as many have done; the answer is to preach the gospel more clearly and strongly. We must clear away traditional confusions and see that the good news is not deficient. The good news - the awesome revelation of God the Father through God the Son - does not merely save our souls, but it itself is the power for us to live our lives here and now; lives that are zealous for good works (Titus 2:12-15). This was Paul's secret (Rom. 8:28-39, Gal. 2:19-20). It is not the gospel, but our view of the gospel, that is deficient, and needs a makeover.